The Marriage Of Figaro, K. 492 (Opera Buffa In Four Acts). Composed by Wolfgang Amadeus Mozart (1756-1791). Edited by Ludwig Finscher and Eugen Epplee. For 5 soprano voices, 2 tenor voices, 4 bass voices, mixed chorus and piano accompaniment. This edition: Hardbound, Urtext edition. Hardback. Figaros Hochzeit. Classical Period. Difficulty: medium-difficult to difficult. Vocal score (hardbound). Choral notation, piano reduction and introductory text. K. 492. 537 pages. Duration 3 hours. 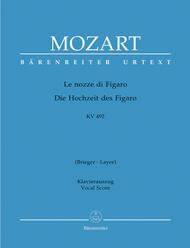 Published by Baerenreiter Verlag (BA.BA4565-92).ISBN 9790006504497. With choral notation, piano reduction and introductory text. Classical Period. 8x11 inches. 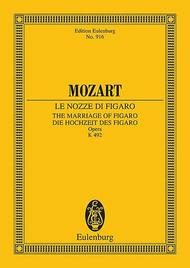 The Marriage of Figaro, K. 492 (Le Nozze di Figaro). Composed by Wolfgang Amadeus Mozart (1756-1791). For Choral, Chorus, Orchestra, Vocal, Voice (Study Score). Eulenburg Taschenpartituren (Pocket Scores). Study Score. 726 pages. Eulenburg Edition #ETP916. Published by Eulenburg Edition (HL.49010375).ISBN 3795763088. 5.5x7.75 inches.